At that point in time, several St. Lawrence County residents committed themselves to this cause and formed the first Board of Directors. In the fall of 1987 the Council opened its doors to the public and began fulfilling the mission of the agency. Originally, the Council was located in Potsdam, New York and was funded by what was then New York State Division of Alcoholism and Alcohol Abuse. At the time the Council consisted of seven staff members. 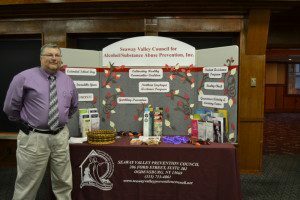 In 1990 the Council relocated to Canton New York and in 1994 the name was changed to the Seaway Valley Council for Alcoholism and Substance Abuse Prevention, Inc. In 2005 the Agency underwent a strategic planning process and adopted our new mission: Improving the future of our community through quality prevention services. Today, twenty-three years after incorporation, the Council is now housed in Ogdensburg, New York and has become a vital part of prevention services in St. Lawrence County. Our agency currently operates with a staff of eleven. To ensure a comprehensive approach, we have adopted and implemented the following strategies from the National Council on Alcoholism and Drug Dependence, Inc., NCADD. Provide objective information and referrals for individuals and family members seeking treatment for alcoholism/substance dependence, gambling dependence and behavioral health problems.